Cover: Australia's Matt Sandford dancing with the 56-weight for distance, en route to winning the event and delivering a dominating performance, for another World Highland Games Heavy Events Championships title. 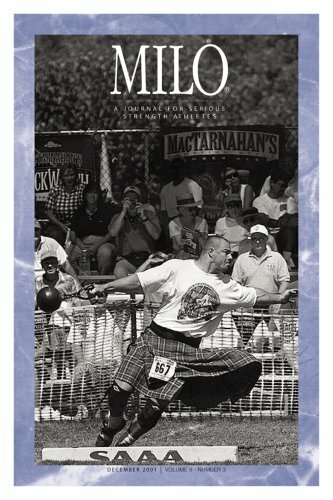 MILO is the world's premier strength journal, with first-rate coverage of training, people, contests, history, and special features. Top authors and photographers provide inspiration and information - bringing you to the epicenter of the action and inspiring personal bests. With a mix of content and photos designed to boost your training and encourage your progress, MILO gives you the tools to be in the know, watch your numbers grow. What's inside this issue? Pro wrestler Superstar Billy Graham - Dr. Strossen reports on creating weightlifting champions in Poland - Training for the farmer's walk - Steve Justa and the one-arm dumbbell partial curl off the knee - A superb contest in the wake of disaster: USA vs. The World Xtreme Strongman Competition - and much more! Like strength? Want to get stronger? Whether you lift, throw, carry, crush, or bend, MILO: A Journal for Serious Strength Athletes is for you. Launched in 1993, MILO transcended the bodybuilding-girlie mag-newsletter models and delivered a top-drawer publication focused on strength. MILO is the only U.S. iron game publication to be awarded media accreditation at the 1996, 2000, and 2004 Olympics - and again in 2008. No virtual-keyboard warrior, MILO walks and talks with the world leaders of the strength world: athletes, coaches, administrators, journalists, and photographers. Only MILO delivers the IronMind strength world to your door four times a year. Randall J. Strossen, Ph.D., is one of Iron Game's best-known authors and photojournalists: he has covered top strength events, including five Olympic Games, worldwide for the past 20 years. Dr. Strossen is the founder and president of IronMind, offering strength training equipment since 1988. For over 12 years, Dr. Strossen wrote the monthly sports psychology columns for IRONMAN magazine and has authored several books on strength training. He is also the publisher of MILO: A Journal for Serious Strength Athletes. Strossen earned a Ph.D. in psychology from Stanford University.